Artists often have trouble promoting themselves, and although we do our best by bombarding social media we’re basically at the mercy of hoping that other people spread the word. I know I’m a bit of a lazy blogger but I’m going to try and remember to post about fellow artists every so often, and do my bit to help bring in more customers for them. 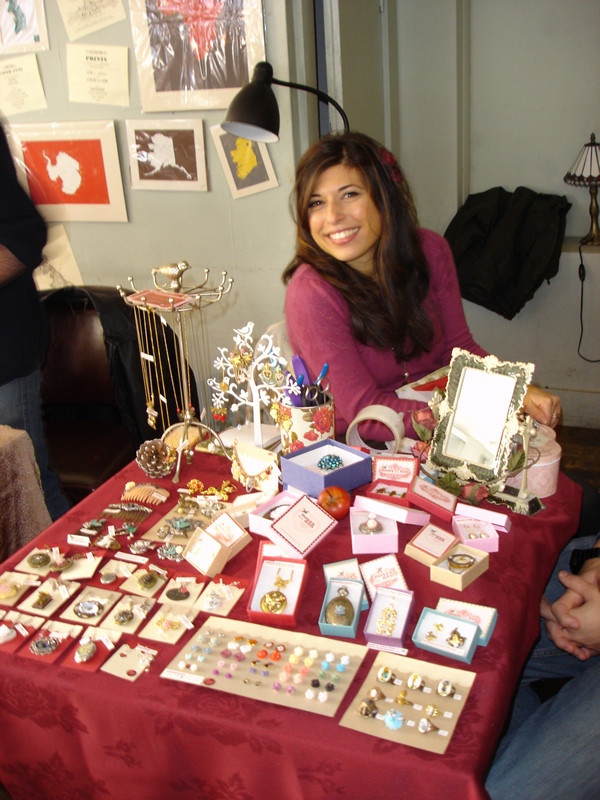 This week we have Fauxcination, which is where you can buy beautiful jewellery handmade by Cindy. Though I don’t wear jewellery myself, I am in awe of how she produces such delicate and intricate wire work. Go and pay her page a visit, and follow her for updates. 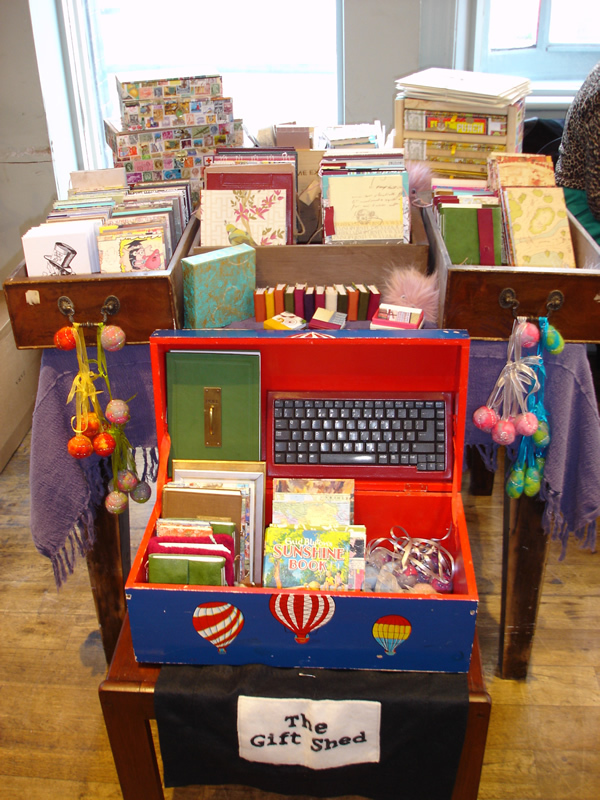 She’s constantly tinkering away and making beautiful things! 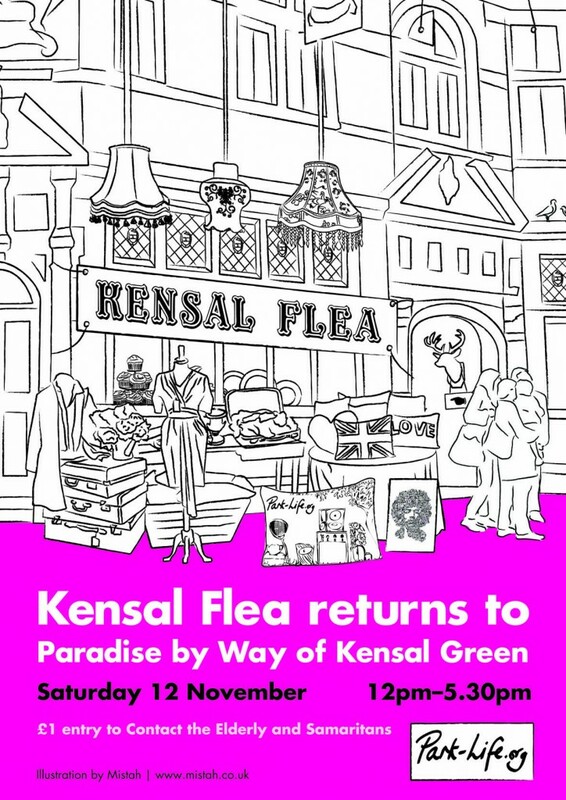 …then pop along to Kensal Flea at the Paradise. 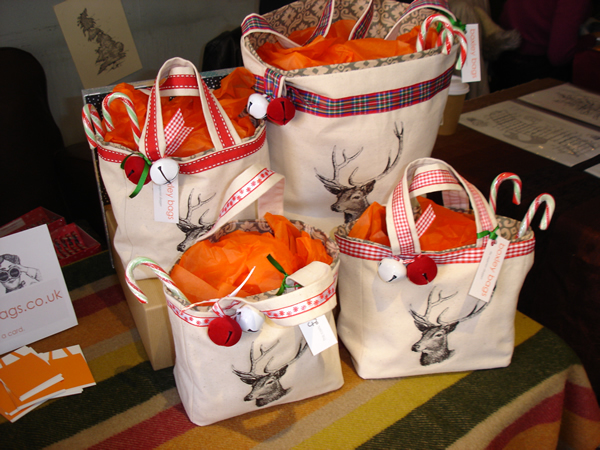 Get all your Christmas shopping done in one place, and then relax with a pint and let Chris Cox entertain you! 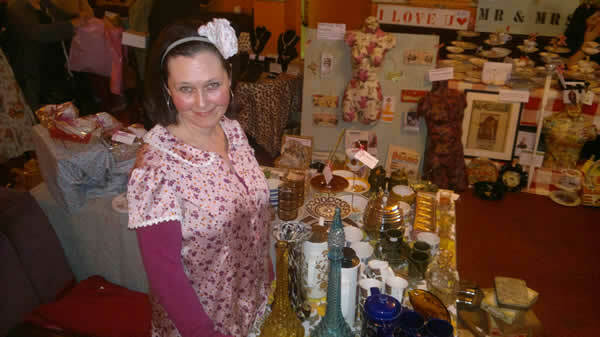 Sarah, of VintageRetroKitsch, doesn’t just sell all things vintage, she lives them. A visit to her house is enough to reveal not only a wonderful collection of furniture and curios, but that she has a keen eye for style. 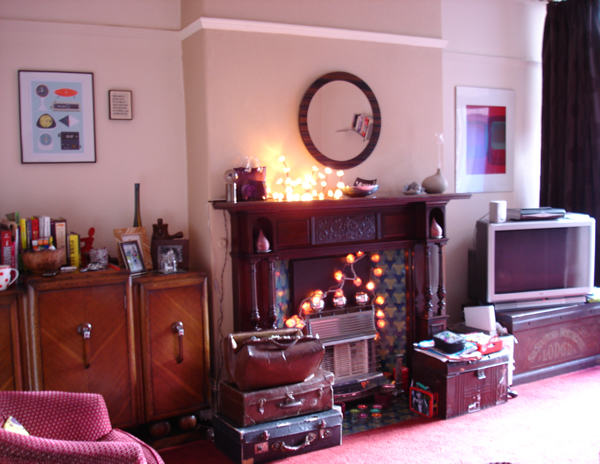 I grew up in a victorian house and it is still my favorite style of property and I have always been used to being surrounded by older furniture, my parents had an antique shop when I was young and I have fond early memories of going to house clearances and being fascinated by all the things that people leave behind. 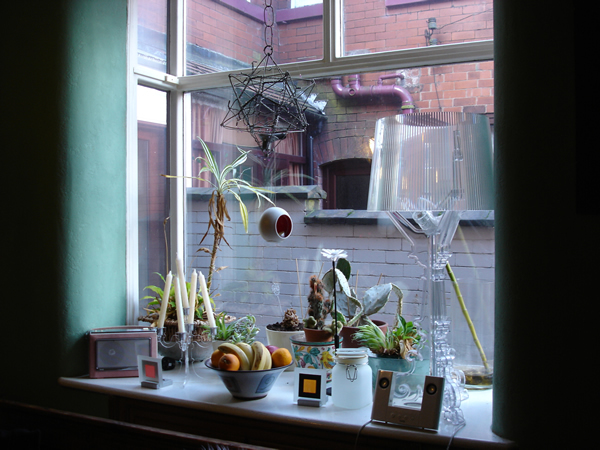 This has carried on throughout my life and although I have flirted with the likes of Ikea I have always come back to homewares with a past and now my home is a huge mismatch of curios and collectables but I love it. Vintage suitcases and trunks look beautiful and also serve to hide the inevitable clutter of toys belonging to her young son. 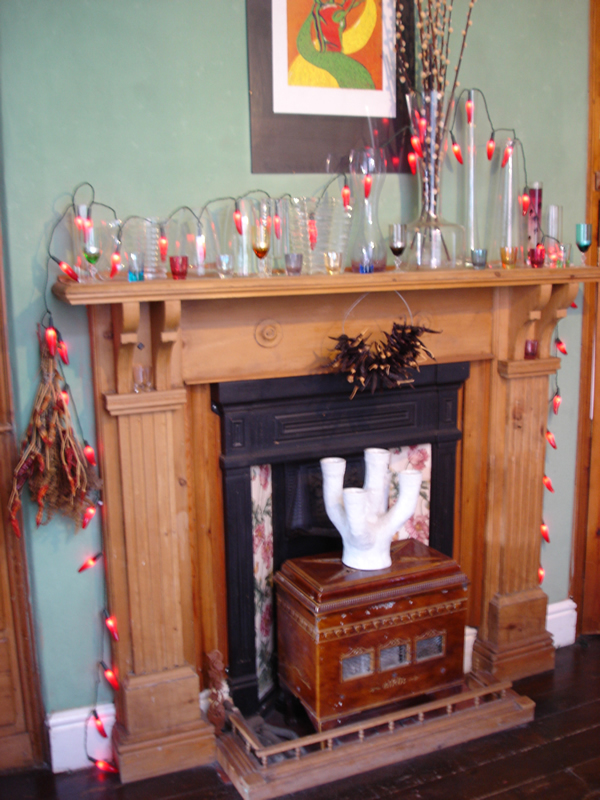 I started VRK really as I found myself coming across great unwanted things all the time and I was fast running out of space to bring them home and keep them! This coincided with a growing trend for vintage so I decided to try my hand at selling. We started about 18 Months ago now and we are slowly building up a loyal fanbase. 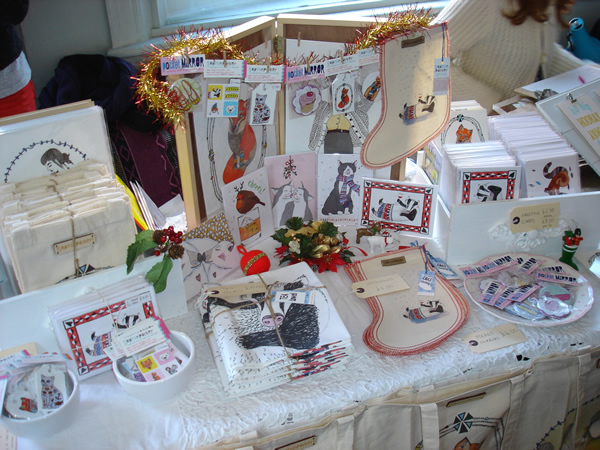 We try to do at least one fair a month and I have an Etsy shop although I am scaling that down as I am not sure its the right medium for vintage, I generate the most interest via my facebook page although I am thinking of sorting out my own website this year, just need a few more hours in my day! 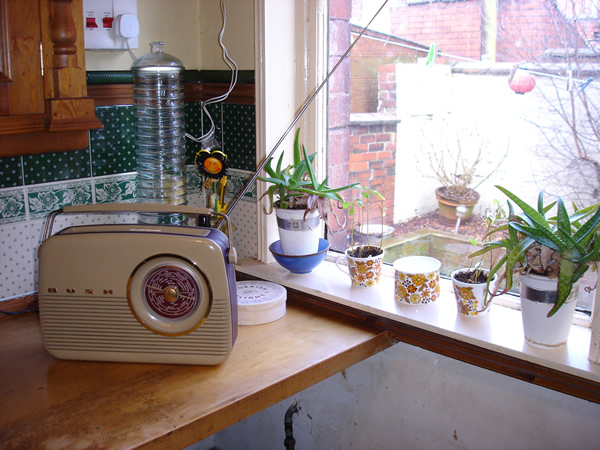 Sarah’s love of vintage is so strongly evident throughout her home that it’s almost contagious. 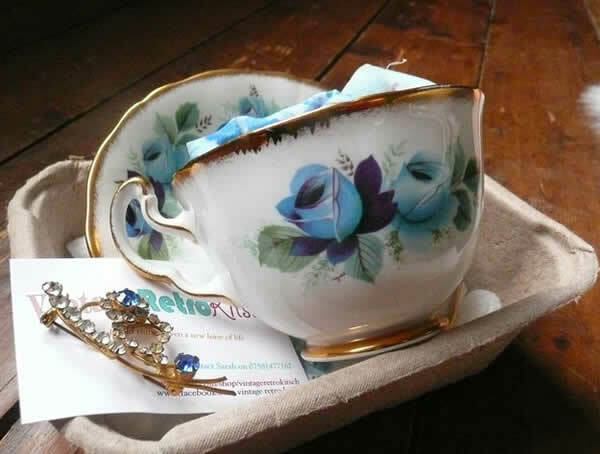 I left her house wishing I had more room to stash beautiful things, and also with a very strong urge to plant things in teacups! She has excellent taste and it’s wonderful to see someone who is living their passion. Sarah trades on Facebook and, for the time being at least, on Etsy. 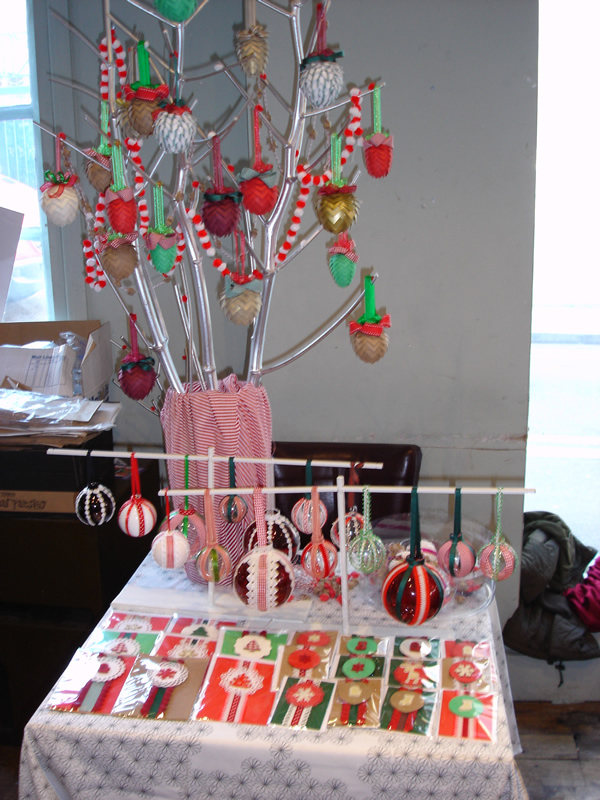 Sarah is based in Bolton and also takes her wares to various fairs in the midlands (for more details please visit her Facebook page) and if you’re in the area when she’s around I’d highly recommend a visit to her stall. It is really the ultimate recycling as we are only really the caretakers of our lives . I love to look at some of my things and imagine the kind of lives they must have led, fascinating. It’s been a very long day but I thought I would come and share some photos before I turn in for the night. 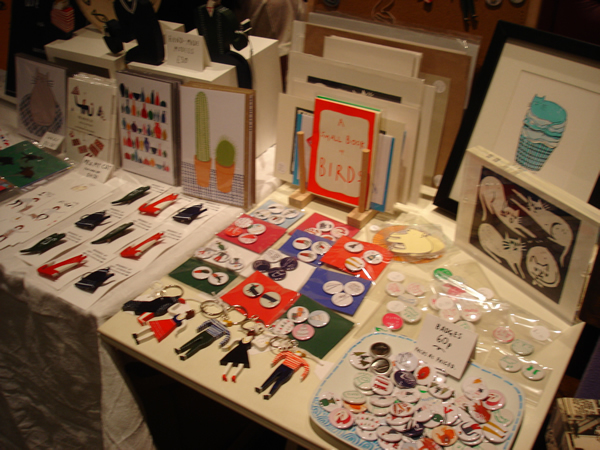 Today I had a stall at Kensal Flea (I was last there in June) and it was, once again, a fun and successful day. 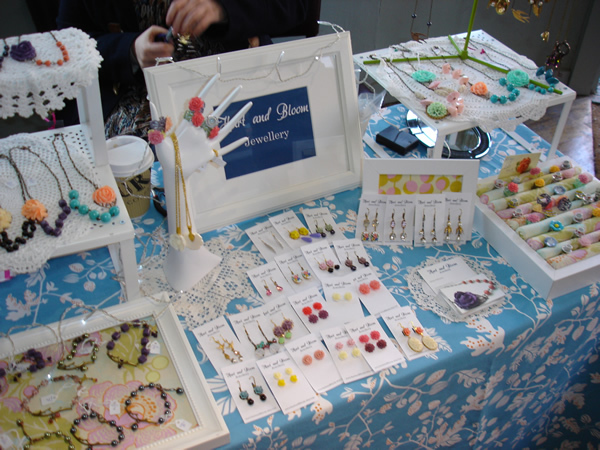 First up we have the obligatory photos of my own stall. Not the best photographs in the world as the light was quite dim in this room! 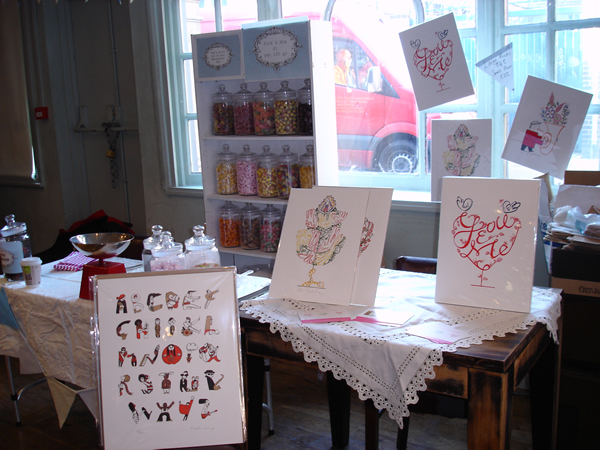 I seem to have a different sized (and shaped) table each time I go to market, and today was no exception. It was a good pitch though, lots of room to spread out, so I was able to display my various trinket boxes much more easily than usual. 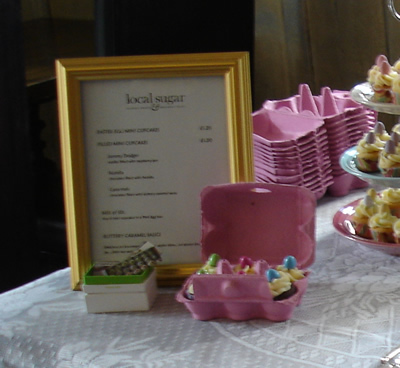 These miniature cakes by Local Sugar caught my eye because they were slightly different from the usual cakes you see around these days. I really liked the small size (let’s face it, most cupcakes these days are huge and a bit tricky to eat without covering your entire face in frosting), and I loved the way they were packaged in egg cartons. 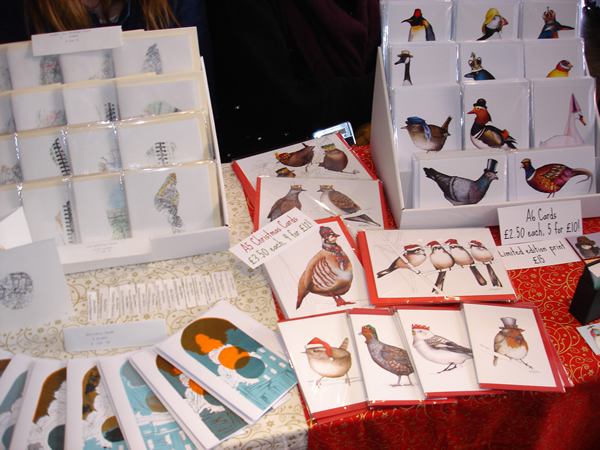 The stall next to me was chock full of interesting bits and bobs designed by Lucy Letherland and Helen Hancocks. Both ladies have a distinct style and I love the quirkiness of it all (despite them clearly being cat-lovers rather than dog-lovers 😉 ). Last, but certainly not least, we have my absolute star pick of the day. Illustrations by Mistah. 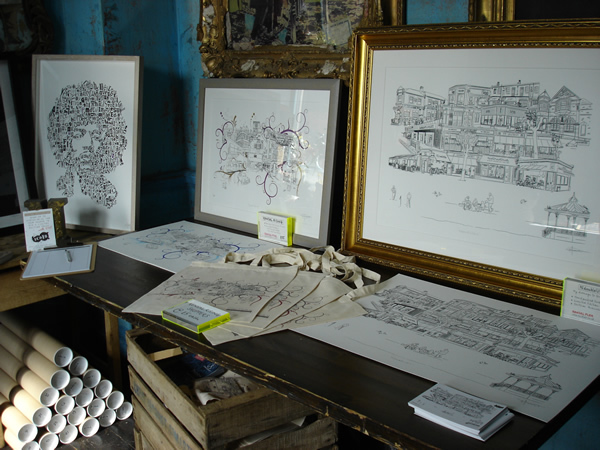 I absolutely loved his work, in particular NdoubleUsix and Kensal Rising which are gorgeous prints featuring local landmarks. 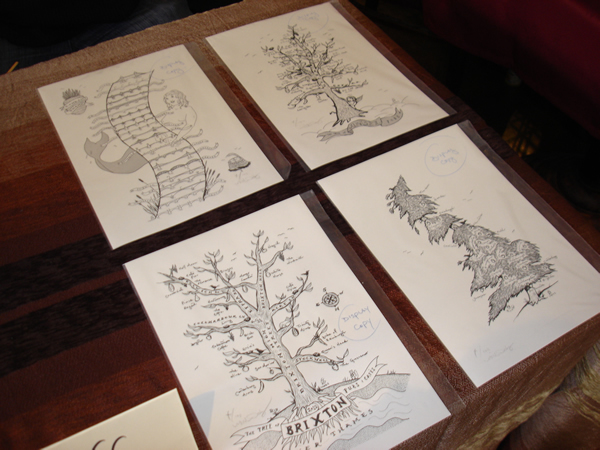 Cleverly and skillfully done, these prints really made my jaw drop. I couldn’t resist buying a shopping bag featuring the Kensal Rising design and I really hope that there are (or will be) bags with the NdoubleUsix design on because I desperately want one! So those were, for me at least, the highlights of the day. 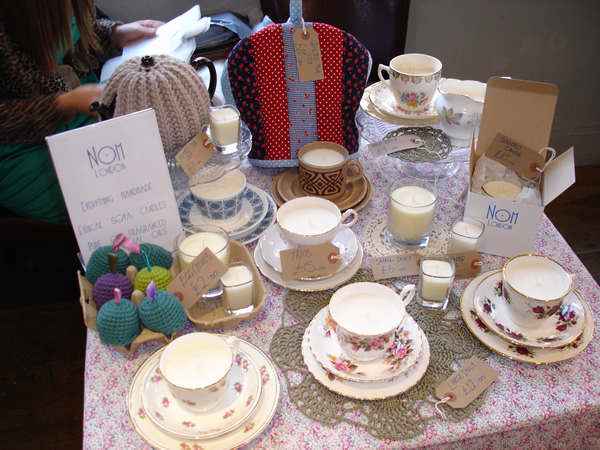 There was of course a grand array of other stalls ranging from vintage fashion to furniture to jewellery and hats. You had to be there to see it all, and if you missed this one then you’ll have to try and visit the next! 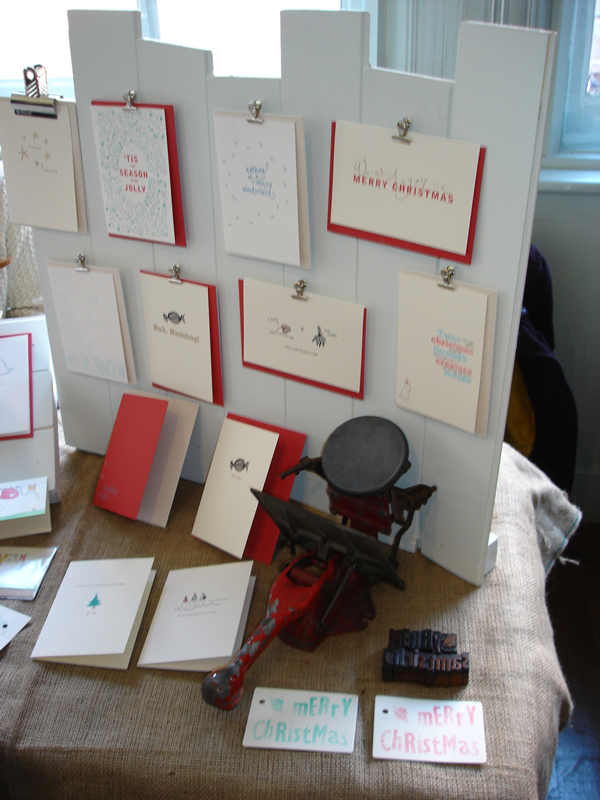 Many thanks to Juliet Kinsman for organising yet another fabulous day. 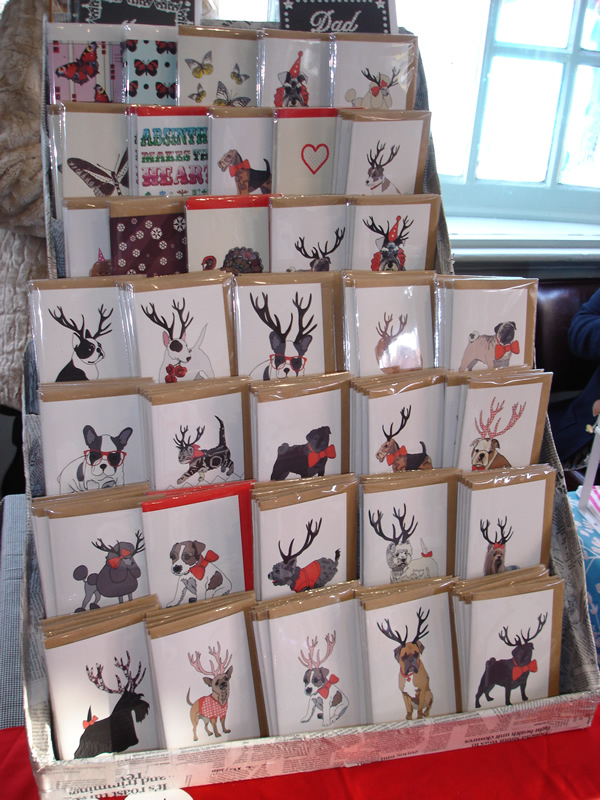 … then pop along to Kensal Flea. Saturday 24th March, 11.30am-5.30pm at the Paradise. 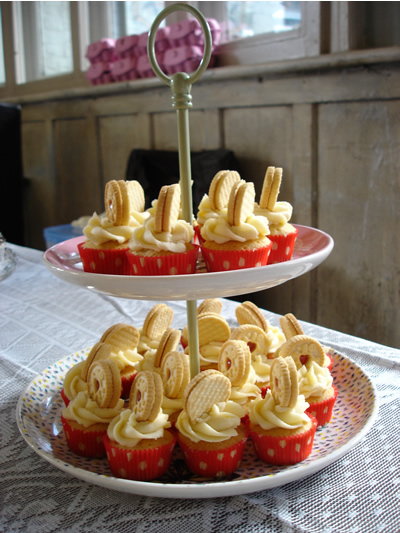 The £1 entry supports Mayhew Animal Home and Trekstock, with a pop-up tea room for Contact the Elderly (vintage crockery supplied by Tamsin Flower, biscuits from Crazy Baker). 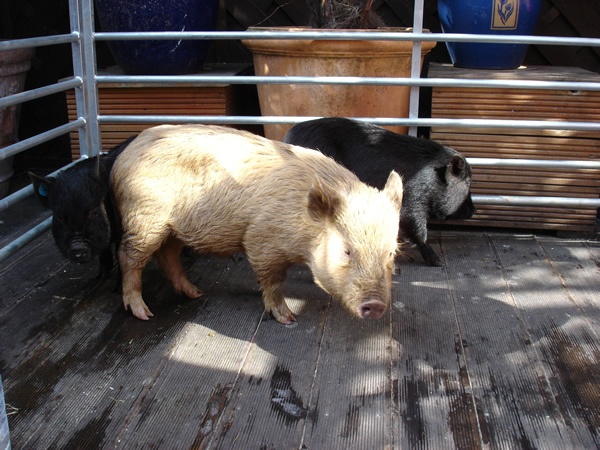 Micropigs to squeeze upstairs on the terrace. Music from DJs Mark Rae and Adrian Rebello. 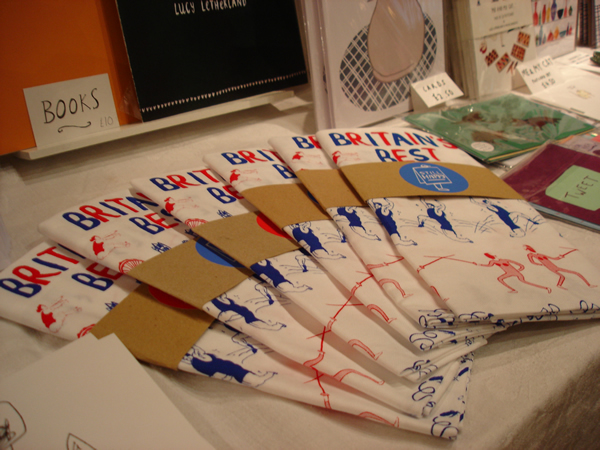 Fairs and markets are something which I do occasionally, and really ought to do more often. There’s no denying that they’re hard work, but I really enjoy the opportunity to see what people think of my work first hand. Making sales is also a good thing! 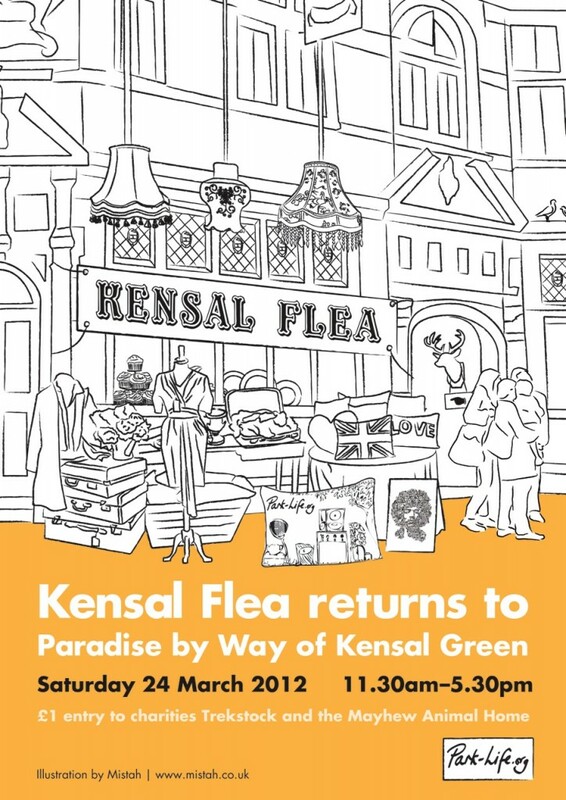 I haven’t done any since December, which is a shame, and I’m therefore really looking forward to Kensal Flea this month. It’s taking place on Saturday 24th March, and if you’re in London that day it’d be lovely to see you there. 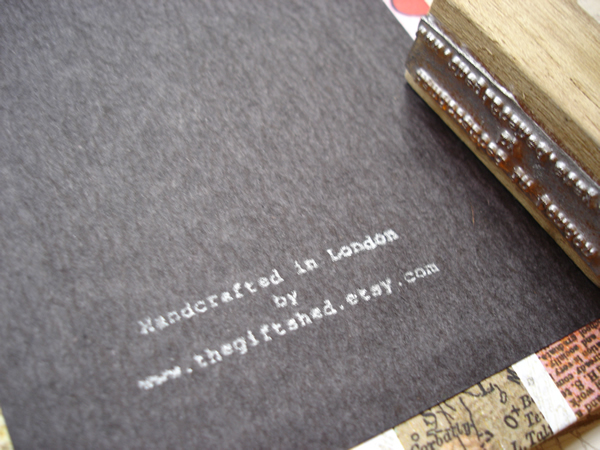 In the meantime I need to continue to make more books, and then get them stamped and labelled. 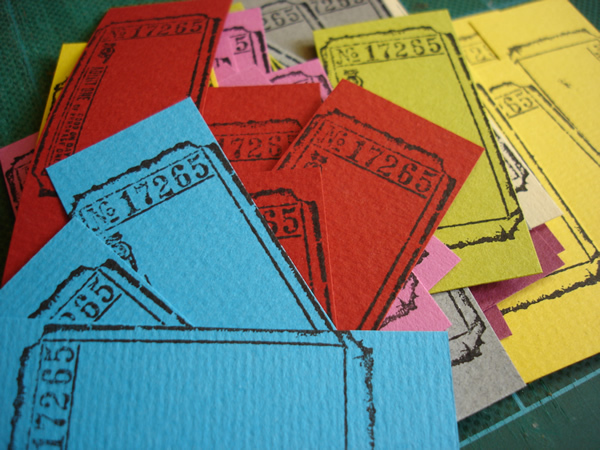 That’s the not-so-fun bit, making price tags and stamping my details into every book. Still, it’s got to be done and as fiddly as it is I do like the way the colourful tags look (all made from offcuts, very little goes to waste! ), and although I still sometimes get the stamp a bit crooked there’s also something quite satisfying about seeing my little rubber stamp put to good use. 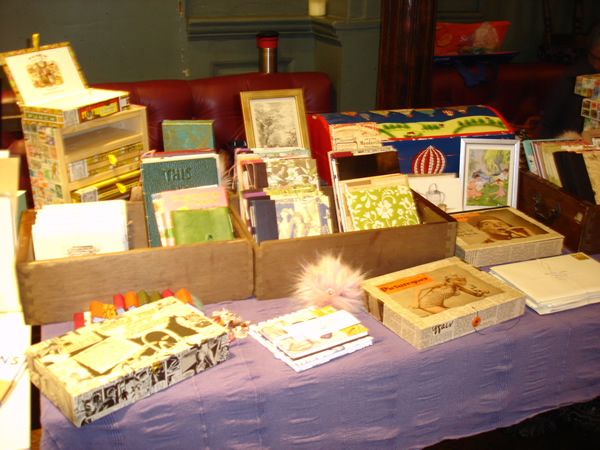 Yesterday saw the second New Vintage event at the Living Bar in Brixton, and it was a roaring success! Here’s a photo round-up of the day. There was mulled wine being served at the bar (two for the price of one – absolute bargain, it’s such a shame I was driving and couldn’t indulge! ), and the fun vintage atmosphere was enhanced by performances from Swinging in Heels, an a capella swing group. All in all it was another fun and fabulous day, and I’m tired but very happy. 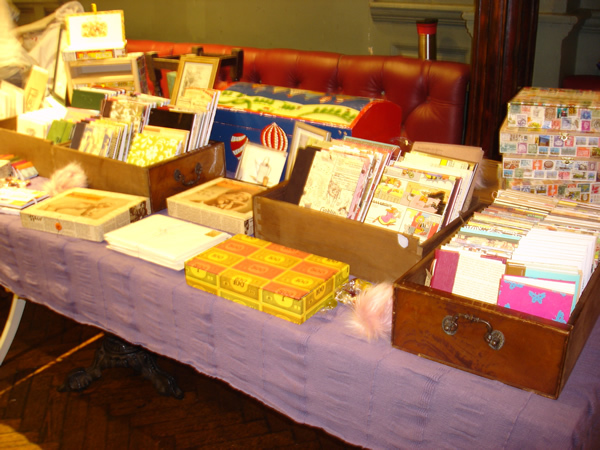 The next New Vintage event isn’t until 11th February, but do put it in your diary now as it’s bound to be worth a visit!